The final assessment as is the case for most ¾ subjects will be the VCAA examination. This is a closed book, 2 hour examination, where all key knowledge and skills contained in the study design is examinable. This will comprise of 50% of the study score. The exam will comprise of two sections: Part A and Part B. Part A is worth a total of 40 marks which will consist of short-answer and extended-answer questions, including questions with multiple parts. One of the extended-answer questions will be worth 10 marks. The number of questions may vary from year to year. (Source: VCAA Exam Specification and Advice). In my opinion, your success in Part A will depend on how well you know the study design, and how accurately you can retain and recall pieces of information within the examination setting. The more information you can retain before heading into the exam, the better you are likely to score in Section A. If you are interested about how to tackle the ten marker, read below. Part B will consist of short-answer and extended-answer questions, including questions with multiple parts. The questions in this section will be scenario-based. There will be at least two scenarios. Scenarios may be actual, hypothetical or a combination of both. Section B will be worth a total of 40 marks. (Source: VCAA Exam Specification and Advice). This is where you will receive stimulus that you will need to refer to in order to gain all the available marks. Practicing answering questions that involve cases, either hypothetical or actual throughout the year will assist you in this section. For example, the 2018 exam provided stimulus relating to legislation passed to prohibit the commercial operation of solariums. Having experience in drawing from case studies in practice questions will greatly assist you in this section! The total available marks for the examination is therefore 80. I personally only did three full exams to time leading up to the VCE examination. Now, to some, this may seem relatively low considering my study score. But here, I want to dispel the myth that completing a high number of practice exams automatically corresponds to a high study score. For subjects like legal studies, I do not believe this is true. Now, don’t get me wrong; completing practice exams, especially in legal studies, in a timed setting is absolutely crucial. This is because it allows you to become accustomed to the time restraint you will be under in the examination and will also allow you to establish how efficiently you are answering questions. A lack of developing these skills will mean you may struggle to finish answering all the exam questions. My legal studies teacher, who is also a VCAA assessor often commented how disappointing it was to see blank answers on the last couple of questions of the paper; an indication that students had not developed their time management skills adequately. However, there are only so many times completing a practice examination will be beneficial to revision purposes. So, for me, after I was confident that I could pace myself adequately through the paper, I began to flip through papers. If I looked at a question and felt confident that I could answer it, I would move on to the next question, rather than answer it. Whenever I saw a type of question that I hadn’t come across before, or didn’t feel 100% confident in, I would answer. This technique meant that I wasn’t spending precious revision time on questions that I knew I could answer, rather, I was focusing on areas to improve. So, whilst I wasn’t completing full practice exams, I was still actively reviewing questions and expanding lapses in my knowledge. This allowed me to cover a large number of practice exams, and see a vast amount of practice questions; more than what I would have if I chose to just complete past papers in full. I'd also recommend a similar approach when studying for SACs. Depending on how many past SACs you have access to, complete a fair amount to time, and then glance over a variety of questions. The dreaded ten marker! Ahh. The question that is anyone's guess entering into the exam, and often the talking point when students leave. it is imperative to practice these questions, as it is the largest amount of marks you can gain (or lose), in any question on the examination. For me, I gained practice on these by completing past examinations and getting it marked by my legal teacher. My advice with these is always spend a brief amount of time (no longer than a minute) coming up with a plan on how you're going to tackle the question. Make sure you are answering every part of the question, too. It will often require you to answer more than one point, but in an exam setting, its so so easy to just focus on the first part of the question, but not the second. Having a plan will ensure you don't go on a tangent and also ensure you cover everything you wish to talk about. Furthermore, always use paragraphs! They help separate your ideas, and make it easier for the assessor to not only see where exactly you are making your points, but also, how you are answering the parts of the question. As the ten marker is marked globally, I also recommend to bring in examples wherever you can, as this will ultimately ensure your answer will have depth. Include them even if the 10 marker does not ask for them. For example, from memory, the ten marker on my question was something along the lines on discussing whether the appeal system was the most effective means on reforming the civil justice system (and to also include reference to a recent reform). In order to argue in favour of the statement, an example I brought up was the case of Mabo v Queensland, which allowed me to illustrate how a judicially active decision of the courts advanced the civil rights of Indigenous Australians. Hence, having a wide (and extended) knowledge of the VCE course will prepare you well for the ten marker. As a general rule of thumb, I wouldn't recommend spending much more than 20 minutes on this question. Like anything, the ten marker becomes less daunting the more you practice it, so have a glance over as many ten markers as you can, from past exams (VCAA or external companies) and have a go of writing up a response. You will improve on these questions the more you practice them, so ensure that you do so, in order to capitalise on such a large portion of the examination of which you can gain marks. This is a crucial area you need to score well in, in order to gain a high study score! Do not give circular definitions! If you are defining a term, make sure you are using synonyms for the term you are describing. VCAA do not award marks for circular definitions. Whilst it is rare for VCAA to ask a define question on an examination (at most will be 1-2 marks out of 80), an adequate knowledge of definitions is still crucial. This is because you can often indirectly refer to the definition of a term within your answer in order to add more depth. Example: Define Equality as it relates to the Principles of Justice. I’m a big advocate in remembering statute/legislation that is relevant to the concepts you are learning about. There are very few pieces of legislation you are required to know about (if any!) but knowing them will add a layer of depth to your answers that will separate you from the state. For example, if a question asks you to explain two purposes of a committal proceeding, you can start of your answer by stating that these purposes are listed in the S97 of the Criminal Procedure Act 2009 (Vic) or that the external affairs power of the Cth Parliament is contained in S.51 of the Constitution. In questions that are marked globally (whereby your answer will be marked holistically by the assessor), the level of depth that your answers contains often will be rewarded with marks. So, if you come across a statute that you think is worth remembering, remember it! If this is a bit overwhelming, focus on the Act itself and omit the year; you will not lose marks for not including the year! Like any subject, notetaking will come down to which method you prefer. Personally, I handwrote all my notes, but this is only because it is what I’m used to. I don’t believe it will make a difference whether you handwrite or type. What will matter, is how succinct you make your notes. As you will soon become aware, legal is an extremely content heavy subject, so the key to being able to handle all this information is to create succinct and summarised notes. There’s no point in writing out exactly what the textbook contains; you should only be taking down information that is directly assessible. Use the study design to aid you with this. Analyse Break into parts and examine, e.g. essential components in decision-making or problem-solving process. Apply Use theory to help in a practical example. Show or make links, relationships or connections. Define Accurately state or explain the precise meaning of a word, phrase or term. Describe Provide a detailed account of something. Distinguish To recognise or show points of difference between two or more concepts of items. Note the distinctive characteristics. Evaluate Talk about the advantages, disadvantages and conclude with an opinion about the topic. Explain To make the meaning of something clear, detailed and understandable. Identify To simply state, list. 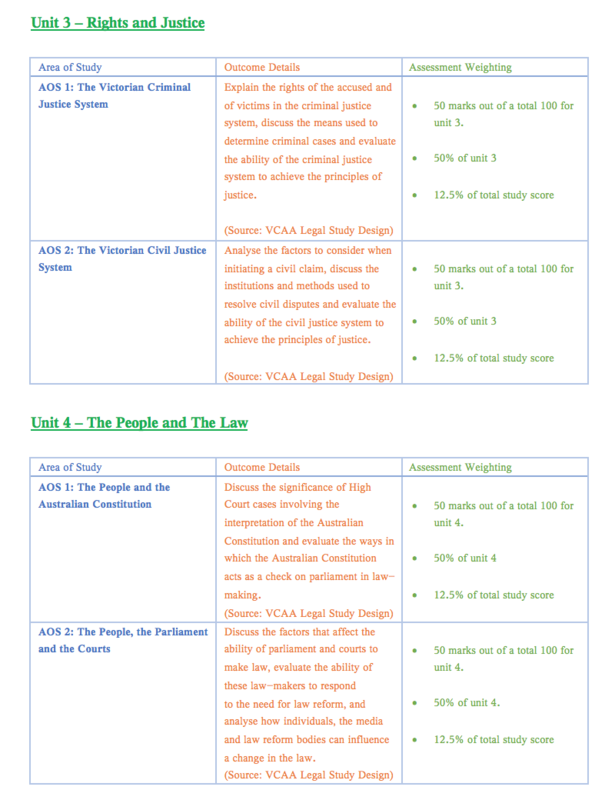 Outline Provide a brief description of the terms or topic. Propose To put forward (a plan or suggestion) for consideration by others. Provide reasons/ Justify Justify your choice or answer. Give valid reasons or evidence to support an answer or conclusion. Say why it is so. 1) Fairness – involves the impartial and just treatment/behaviour without favouritism or discrimination; free from bias or injustice. This applies to all of the processes involved in the criminal and civil justice systems. It does not mean that everyone necessarily gets the same thing, however. Sometimes, people need to be treated differently in order to achieve fairness (the way a victim of a sexual assault may give evidence may be different to that of a family member of the victim). 2) Equality – People should be treated the same in the eyes of the law and have the same opportunity to present their case without advantage or disadvantage. 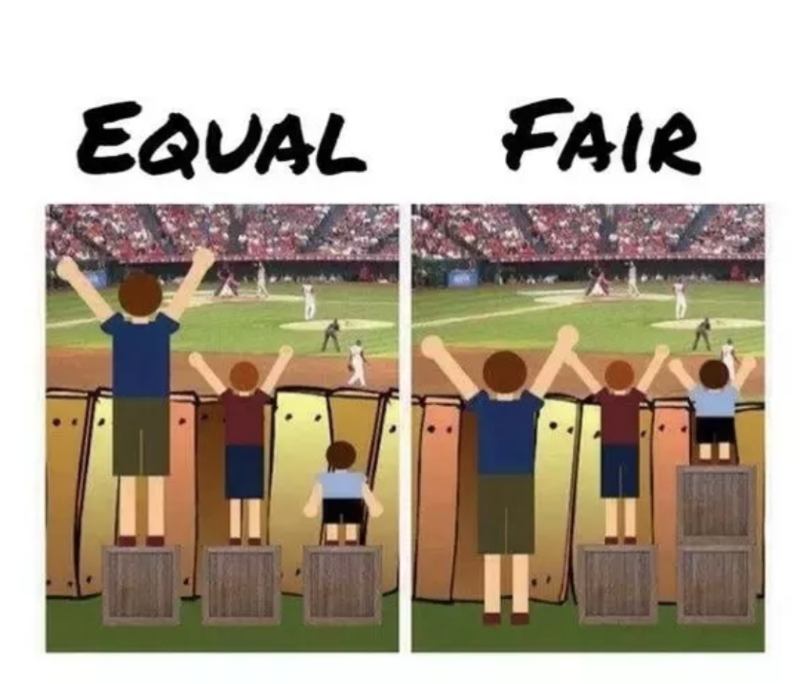 I initially found it difficult to grasp my head around the difference between fairness and equality. But the following visual aid may help you, as it did me. 3) Access – The notion that people should be able to understand their legal rights and pursue their legal claims in court. Questions that mention the principles of justice will generally require you to explain how a certain element of the criminal or civil justice system achieves or does not achieve a certain principle of justice. With these questions, I’d encourage referencing a definition of the principle you are explaining, and then explain how the element of the justice system you are explaining does or does not meet this principle. AOS 2 is concerned with Civil Law. Like Criminal Law, I believe it is crucial to have an understanding on how the civil justice system works. This will allow you to properly distinguish between Criminal and Civil law in general, and thus aid your understanding. Civil law is concerned with resolving disputes between two parties (or more) in which one party has allegedly been ‘wronged’ by the other through infringing their rights. The aim is to restore the affected party to their original position before the alleged offence took place to the extent that is possible (generally through monetary means). As mentioned above, you will be expected to refer to the principles of justice in this area of study. As per the key skills, you must be able to discuss the significance of both a case that involved the interpretation of the Constitution (S.7 and S.24/Division of Law Making Powers), analyse the ability of the Australian people to protect or change the Australian Constitution and discuss the impact of international declarations and treaties on the interpretation of the external affairs power. F- Facts. Briefly mention what the case is about. I - Issue. What does the court need to decide? D - Decision What did the court decide? The crux of your answer should be focusing on the impact. These questions are often poorly answered. For example, the 2015 legal exam asked students to explain the significance of one case in which the High Court’s interpretation of the Commonwealth Constitution had an impact on the division of law-making powers. In the examination report, it was noted that: "This question asked for an explanation of the significance of the case, and not an explanation of the case. There is a difference. The first requires a focus on what the case stands for and, in particular, how it impacted on the division of law-making powers. The latter would require only a factual explanation of the case, which may not include an explanation of its significance." Hence, reading what the question is asking of you is key! If you need to explain the impact, focus on the second I of FIDI. Ultimately, Legal was such an engaging and fun subject to study and I hope you find that, too! I may end up adding more information to this thread; if you want me to touch on a certain aspect, please let me know. Best of luck! Kudos to you for taking the time to write such an intricate, helpful guide!